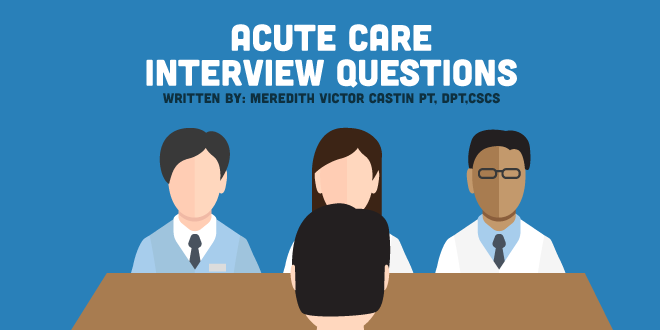 So you landed an acute care physical therapy interview. Awesome! Props to you for creating an awesome physical therapy cover letter! Now comes the scary part: the interview! But you're going to crush it because you're going to be prepared for the questions they'll ask, and you'll have practiced your answers in advance. Of course, they're also evaluating your bottom line. Will you make them money? Make the department look good? See enough patients in a day? Keep said patients safe? Get along with the rest of the team? Roll with the punches when your precious Hello Kitty scrubs get sprayed with human urine? They also want to make sure you're not planning to grab 6 months of experience and mentorship, then high-tail it to the nearest competitor hospital. I was originally an accountant, but I realized that my true calling was PT, so here I am! I completed my clinicals at an acute rehab clinic in Las Vegas, NV and an outpatient ortho clinic in San Diego, CA. During school, I was president of the PT Student Assembly and attended CSM all three years. I am ready to join an acute care team, where I can hone my early mobility skills and learn from experienced clinicians. Always be prepared for this one, because it’s more likely than not that you’ll be asked this question. Be honest. Highlight your true strengths. Even if you never had an acute clinical, if you get along well with people, are receptive to feedback and are willing to be flexible with your work hours, say so! Conversely, if you roll out of bed 15 minutes before you're to be at work, don't pretend like punctuality is your jam. Let's talk about weaknesses. It's all about spinning your weaknesses as strengths. If you lack confidence and doubt your clinical skills, don't say that! Instead, consider saying "I tend to second guess myself at times, but I always seek out an experienced clinician when it's a question of safety." Again, the hospital wants to know you'll respect your teammates and not kill your patients. The best way to answer this question is to be as honest as you possibly can, while portraying how grateful you are for the opportunity to get this job (hopefully). If you see yourself owning a private practice one day, say that you'd like to be in a leadership position. Say that you would love to join (insert name of hospital) and hone your clinical skills. In time, you can see yourself in a leadership role, ideally surrounded by a team like the one at (insert name of hospital). That leaves things wide open. It shows gratitude, commitment to growth, and ambition. It doesn't show that you may be bailing in a few years. 4. Tell me about a time you made a mistake. "What's an example of a time that you made an impact professionally?" 1. What are post-operative hip precautions? It's more likely than not that you'll get this question. You learned this in PT school, but in the moment, it's easy to freak out and freeze in an interview. Remember, there are multiple approaches to a total hip replacement. The two most common are anterior and posterior. But the question was about "post-operative hip precautions", not THR/THA. So the best course of action in the moment is to clarify, just like you would in real life. If it's an ORIF, say you would check the surgeon's post-op surgical notes, as each one is different. But from your experience, they're either NWB or WBAT. If it's a hip replacement, ask if they mean anterior or posterior approach or, ideally, simply answer: "For a posterior approach: no flexion past 90 degrees, no internal rotation of the hip, and no adduction past neutral. For an anterior approach, each surgeon differs, but the standard is no extension, no external rotation, and no abduction." 2. What are the post-operative spine precautions? It's less important what type of spinal surgery a patient had in this case. The precautions tend to be the same. No bending, twisting, or lifting. Always make sure that they log roll in and out of the bed. However, always, mention that you will carefully read the post-op note and clarify any questions you have with the physician. Don't rely on the nurse to know details about mobility, as they are likely looking to you to provide that information to them. 3. What is the first thing you do when you get your schedule each morning? I say a friendly good morning to the team and then start calling the floors. I like to coordinate with nurses early and check in on each patient to see how they're doing. That helps me to prioritize my chart review and set the flow for the day. 4. Tell me some absolute contraindications to exercise. Every hospital has its own policies on absolute contraindications, but a safe bet is to review your boards notes and go from those. You can also mention that a nurse refusing or a doctor refusing is a good reason to say no. This is a good time to note that you always check in with the nurse before you work with patients, even if you already called them in the morning. Lord knows, patients in acute care can take a turn for the worse in just a few hours, so communication with the nurses is key! 5. What is a hallmark sign of a left middle cerebral artery infarct? Jeeesh! This one was easy during the boards, but sitting in front of an interview panel changes things. Just like anything else, take a deep breath and center before you start rambling. Don't be afraid to ask questions to make sure you heard the question correctly! Did they say left? Did they say middle cerebral vs anterior cerebral? My way of remembering is pretty lame, but it works. MARM (Middle cerebral artery = ARM) and ALEG (Anterior cerebral artery = LEG). So it'd be right hemiplegia, especially in the arm. "Weakness of the right arm!" 6. You are walking your patient and they start to fall. What do you do? 1. What is the best thing about working here? And what are the challenges that are unique to this particular job and how do you work to address them? Obviously, a red flag would be that they have no plan to address department challenges! And make sure that you detect a warm, honest response about organization's strengths! 2. To whom will I directly report? There should be a direct pecking order, meaning you will likely have a supervisor, and they, in turn, will have a manager. But you also may have a lead therapist, and clinical questions may be directed to him/her. It's good to know these things in general, and it shows professionalism to take the initiative to ask about it during an interview. 3. What does success look like in this role? This will give you a very good idea about what the hospital values. Listen carefully, because if the first thing out of your interviewer's mouth is about therapist productivity, you may not get the mentorship or support you want. 4. I really want this job! When do you expect to make your decision? This will show initiative and enable you to put your mind at ease if you don't hear anything for a week or two. If the call was from a director of the department, you’ll want to be prepared to answer clinical questions.